Our 2019-2020 Season, a dazzling concert series. 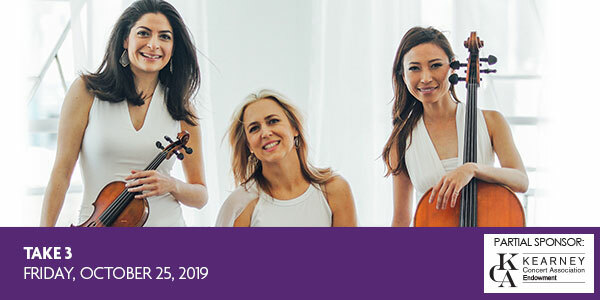 Take 3, comprised of Lindsay Deutsch, featured violin soloist with Yanni; Susan Boettger, piano; and Lila Yang, cello bring the re nement of a rigorous classical background and mixes it with rock star charisma. From Billy Joel to Beethoven audiences around the country are being entertained with limitless enthusiasm for great music.